Hoover Middle School's Leone Faiivae-Naufahu won first place in the 2012 Museum of Latin American Art Poster Contest. His entry addressing the question, “How does art improve our quality of life?” included a visual image and original slogan of “Art is My Voice.” He won the $250 prize. An entry by classmate Matthew Bustamante, “Art, We are Unique,” won honorable mention. Each year, MoLAA showcases the burgeoning talent of artists from Los Angeles and Orange County middle and high schools, providing the opportunity to compete for cash prizes. Their work was displayed at the museum during the recent award ceremony. Hoover art teacher Christine Yu continues her tradition of success with the MoLAA contest. Her student, Christine Van, won first place in the middle school competition in 2010 and 2011, and again in 2012 as a Poly High School freshman. 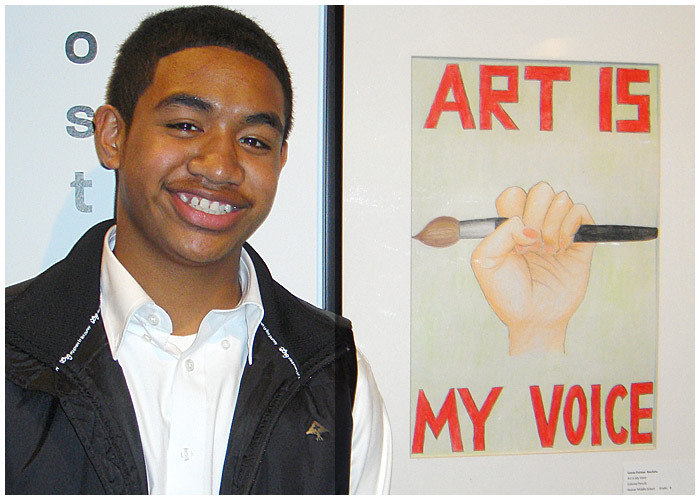 FIRST PRIZE -- Hoover Middle School student Leone Faiivae-Naufahu won first place for his "Art is My Voice" piece, displayed recently at the Museum of Latin American Art.